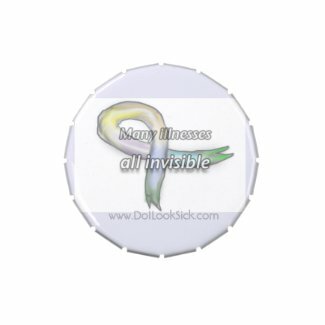 Invisible Illness Survival Kit – Purses – Do I Look Sick? Hello blog people! I hope you had a lovely holiday and you’re enjoying some time relaxing. No, baby has not made their grand debut yet, and we are t-minus 12 days to the due date. It could be any day now! Now, I don’t know how spoonie guys handle their invisible illness supplies, but for us lady spoonies, a purse is an absolute must. I know because I hate purses and would never carry one if I didn’t have to. Even I have to admit that carrying a purse has saved events and created extra “spoons” for me when there were none. (to read the “spoon theory” click here). Or of course you could use a pill box, and if the SMTWTFS isn’t your style, check out the Do I Look Sick store for some cute ones! But I’m lazy and usually just keep my prescription bottles in my purse. I don’t have a ton, so I can – people with a wider array probably can’t get away with that. Of course, most spoonies keep over the counter meds on them too, like tylenol for pain, benadryl for allergies, etc. No matter what, it usually ends up being more pills than one can really stuff into a pocket. Or at least the pocket of women’s pants. Maybe this is why guy spoonies don’t need purses. Anyway, there are a lot of other handy things to keep on you at all times. Another big one is food. Whether you have allergies, stomach problems, or just need something to take pills with because sometimes it’s hard with just water, keeping snacks that agree with your digestive system and keep your blood sugar up are essential. You might show up to an event serving food you can’t eat, or you might end up staying out longer than planned and need a boost or food to take with medication. No one knows you better than you, so you know what snacks will get you farthest. Relying on buying the food you need while you’re out won’t always pan out, especially if you’re stranded with a vending machine or impulse buy candy at the register and nothing else. On a less fun note, it’s also important to have your insurance on you at all times. If you’re chronically ill, you’ve probably been to the ER. There are many situations in which you may need to go to an ER that isn’t at your usual hospital. If you do, you’ll want all your insurance info, IDs, and medical alert tags/IDs on you. My walking pharmacy was disguised as an adorable cat. Yes, it’s the cat from Trigun, which I’ve never watched and know nothing about. Baby!Rachel just liked that it was a cat, and so does adult!Rachel. I recently switched out, though, for a tote bag that I actually received from a reader! I could not for the life of me find one of me holding it but it’s the cute blue tote in the background with the white lucky cat on it. Thanks Tosha! Check out her blog Bottled Time! Not only is it adorable but it has a little pocket at the top on the inside that I can stick my phone or keys in so they’re not lost in the sea of pills and miscellaneous flotsam in the main bag area. So you don’t have to go get some fashiony purse for your portable pharmacy if that’s not you. If you must have a purse, have one you love! Stay tuned, I do have updates on our birth center plans! Plus baby will be here soon, along with plenty of pictures!